Antonio Stradivari is perhaps the most well-known maker of violins the world has every known. His violins were all made in the late 1600s-early 1700s and are amazingly valuable – both in terms of finance and sound. They’re easily worth upwards of millions of dollars (yes – millions) and are essentially recession-proof. A Stradivarius that was worth $5 million before and after the recession was also worth $5 million DURING the recession. They’re so valuable that the musicians who play them are rarely the actual owners of the instruments, but instead play them on loan from wealthy benefactors and organizations. Some times they’re even played as a result of winning music contests. Needless to say, they’re played for and enjoyed by audiences all over the world. I’ve recently picked up some wonderful new violin music in which I’ve discovered a trio of violinists who are each playing (or have been playing) a Stradivarius. On these albums, they each convey pride in their homelands by way of the music recorded. Scot Nicola Benedetti, American Anne Akiko Meyers and Russian-born Philippe Quint all play their violins to showcase music from their native countries. There’s so much beautiful music written so together they make for an excellent sampling of what goes beyond the most famous violin music such as Vivaldi, Mendelssohn, Beethoven or Berg. Though we still have a taste of those in Quint’s rendition of the Tchaikovsky, we also have Bruch, Arensky, Bates and Barber. There’s a great variety of styles perfect for someone wanting to delve further into the music of that instrument. Stradivarius connection: Nicola Benedetti plays the Gariel Stradivarius violin on her latest album, “Homecoming: A Scottish Fantasy” on which she plays music, along with the BBC Scottish Symphony Orchestra, that all has a Scottish connection in one way or another. It’s an eclectic mixture of styles ranging all the way from romantic-era classical to traditional and familiar folk music. Take a listen because you’re in for a real treat. It starts with a delightful performance of Max Bruch’s 4-movement A Scottish Fantasy, pretty much the only truly classical piece of the CD. Originally written in 1880, it was based on Scottish folk tunes dedicated to the virtuoso violinist, Pablo de Sarasate. From what I’ve read about it, is a rather intricate and difficult piece to play which Benedetti plays just beautifully. From there it transitions to the traditional Scottish folk tunes on which the popular and especially fun Bonnie Banks of Loch Lamond was based. My favorite, I think, was probably Spey in Spate and the Hurricane because it sounds the most like stereotypical celtic music played both exceptionally well and crazy fast! The album is a real treat to listen to and offers up a different side to the violin’s repertoire than classical music fans are accustomed but which I think they’ll welcome. Scotland has been in the news quite a bit lately thanks to their recent vote on independence. This album grants the listener a shining example of why the Scots should be so proud of their heritage. American violinist Anne Akiko Meyers has just put out a new album of two violin concertos by American composers. It includes music by Samuel Barber, John Corigliano and Mason Bates. Stradivarius connection: Admittedly this is a bit of a stretch, but Anne Akiko Meyers currently plays the 1741 “Vieuxtemps” Guarnari del Gesu given to her on lifetime loan. That said, she previously played the 1697 Molitor / Napoleon Stradivarius as well as the 1730 “Royal Spanish” Stradivarius. Composer Samuel Barber was first commissioned to write a violin concerto in the late 1930s which he started in Switzerland. However, when the war broke out, he (and all Americans) were advised to leave Europe so he went back to the US where he found a nice, quiet spot in the Pocono Mountains to finish his work. He’d already sent the first two movements to the intended performing violinist by that time. After sending the third movement, the violinist was disappointed that it didn’t contain as much substance as the first two movements and thus didn’t fit in. He expected something that would match the level of substance first two movements and thus make it worthy of performing. His violin coach, not even happy with the first two, had already written a letter to Barber saying they would have to be “surgically operated” on by a “specialist” (such as himself, of course) to improve them and make them worthy of being played. In the meantime, Briselli, the violinist, also asked Barber to rewrite the third movement. Barber ultimately didn’t do that and the planned performance by Briselli was canceled because he didn’t want to play something he felt was too easy and thus, not what he’d originally expected. It was debuted a couple of years later, in 1941, by Albert Spalding (nephew of the Spalding – sporting goods – name) under the direction of Eugene Ormandy. It’s now become an oft-performed 20th century violin concerto. Meyers’ interpretation of this piece shows it definitely belongs among the great violin concertos and the third movement especially is incredibly well-played. It’s fierce, action-packed and full of non-stop energy – a beautiful ending to this concerto. If all you know of Samuel Barber is his Adagio in Strings, you should change that now because you’ll just be depriving yourself of a musical work that, in my humble opinion, is far better and definitely more exciting to listen to! In the middle of the two concertos, is a beautiful lullaby by John Corigliano. 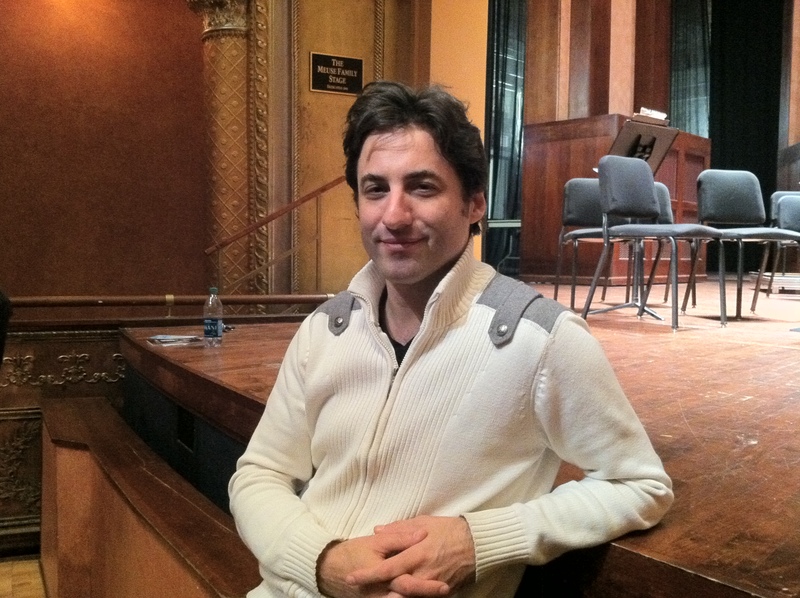 Mason Bates is an American composer, younger than I am, whose violin concerto is seeing its debut recording here. New music usually freaks me out, but this is awesome! I love it! Athletes have the Olympics. Composers have the violin concerto. Archaeopteryx. Really? Yeah! And it’s really great. I’m not a violinist, but this just HAD to be fun to play! Meyers puts forth an outstanding performance. Even if you don’t like the modern stuff, you will really enjoy this recording. It’s odd, different, fun and above all, it’s exciting! Really exciting. I can’t wait to see what else this up and coming composer creates! Picture of Philippe Quint after his performance last November. He performed again in the same theatre, Columbus’ Southern Theatre, this past Saturday. Saturday night during the intermission, they had a table set up to sell some of Philippe Quint’s recordings. I picked up the recording of the caprices from The Red Violin. He had just played #s 5-6 as an encore after his performance of the Chaconne. I definitely wanted a copy of that. (I learned that the Friday night audience didn’t get an encore, so we’d scored a real treat.) I also picked up a copy of his latest CD of the violin concerto by Tchaikovsky and the Violin quartet by Anton Arensky. Sorry for the glare – I took it with my iPhone at Staufs in Grandview after the concert. Stradivarius connection: Played on the 1708 “Ruby” Stradivarius, Quint’s take on the Tchaikovsky concerto is just incredible. It’s beautiful. It’s sublime. Like I said before, I’m definitely a fan! I’ve heard it several times before and have thoroughly enjoyed it, but I felt like his recording made me more a part of the performance rather than a generic dry recording. I don’t know – maybe it’s that added bit of Russian passion added to its playing that elevated it to a whole new level. Or maybe it’s the fact that he’s just now getting around to recording something he’s already performed over 200 times which implies a definite comfort level with this piece of music. Within the CD itself, the listener is actually treated to two different versions of the 3rd movement: the original as written by Tchaikovsky as well as the version changed and revised by violinist Leopold Auer. I still haven’t made up my mind. Anton Arensky was a contemporary of Tchaikovsky who didn’t always seem to get as much play time. In fact, in one series of concerts, Tchaikovsky wrote to the conductor (I think) to ask that Arensky’s music be worked into the concert in lieu of Tchaikovsky’s Romeo & Juliet because Arensky was beginning to feel depressed that his music wasn’t being played as often as he’d hoped. Arensky later wrote Variations on a Theme of Tchaikovsky for string Orchestra, Op. 35A. Arensky is well-known for his chamber works, one of which is featured here: a violin quartet that is just beautiful. I already had a digital copy of his new album, but since he was signing them at intermission, I jumped at the opportunity to snag the actual CD. 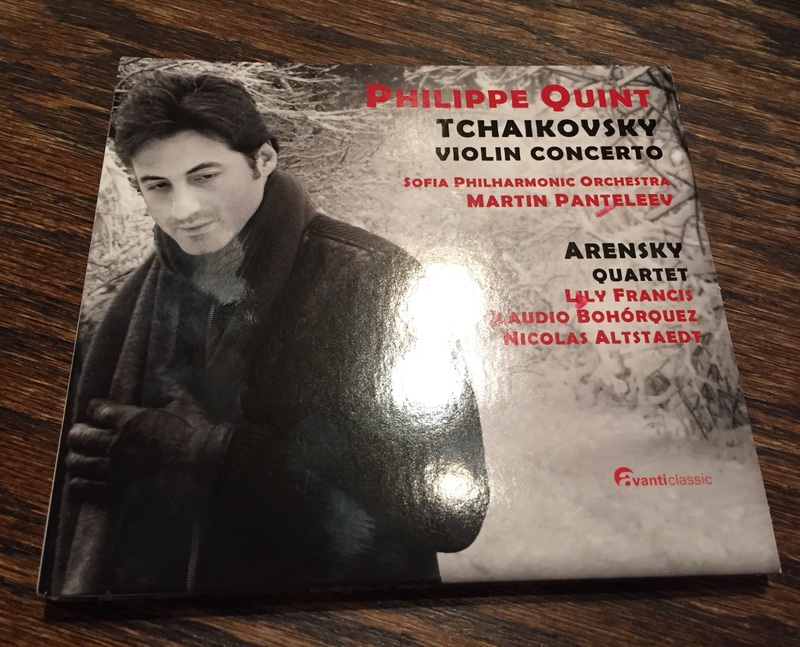 It was recorded with the Sofia Philharmonic under the direction of Quint’s friend, Martin Panteleev. I had to ask him about Bulgaria since I used to live there and was told he thinks it to be a lovely country – has lots of friends there, Panteleev included. I lived pretty far away from the capital and was unfortunately never able to be in Sofia for an actual symphony performance, so I guess that means I just need to go back! In the meantime, you can learn more about these musicians and their respective music by visiting their websites linked below. Tags: Anne Akiko Meyers, Classical Music, Nicola Benedetti, Philippe Quint, Violin. Bookmark the permalink.